How do I register for Grade Camps at Camp Harmattan? This video will walk you through the registration system and give you the details that you need to know in order to be able to register for Harmattan Summer Camps. How does the One-Day Only Flash Sale work on February 27? All Grade Camp registrations received on February 27 will receive 27% off. This discount will be automatically applied at the time of registration and cannot be combined with any other offer. Payment must be made in full or sign up for the payment plan at the time of registration in order to be eligible for the discount. All Grade Camp registrations require a deposit of $20 per camper paid by credit card at the time of registration. What if my church is paying? That’s awesome! You will need to enter the discount code provided by your church. On the payment options page, select the church sponsorship payment method. Both the church-specific discount code and the church sponsorship payment method must be selected for registration to be accepted. For the one day flash-sale on February 27, the 27% off can be paid by a church. However, payment meets to be made on February 27. A list of what to pack for a week of camp can be found by clicking here. Our tuck shop (candy store) is open each afternoon for students to buy treats. Campers can enjoy pop, chips, chocolate bars, 5 cent candies, slushies, and ice cream. We recommend $2-$3 a day and $15 should suffice for a week of camp. How do I register for Family Camp at Camp Harmattan? This video will walk you through the registration system and give you the details that you need to know in order to be able to register for Family Camp. How do I register my long term site? 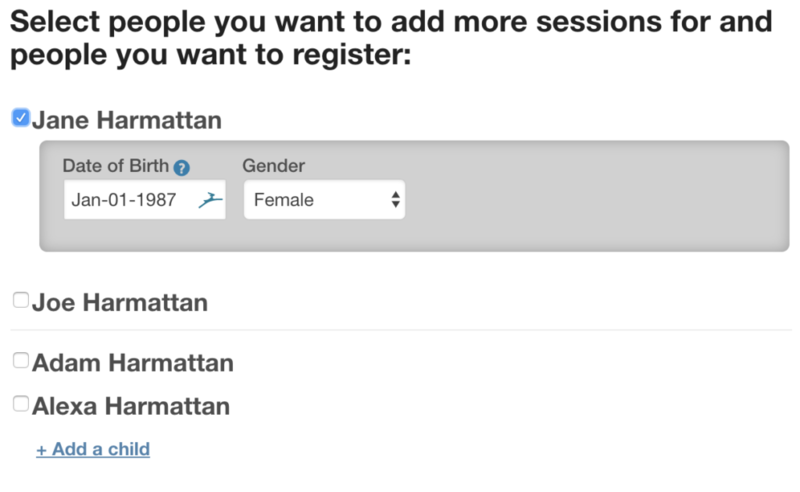 Have one person in your group select either entire week site registration in Step 2: Select Sessions. 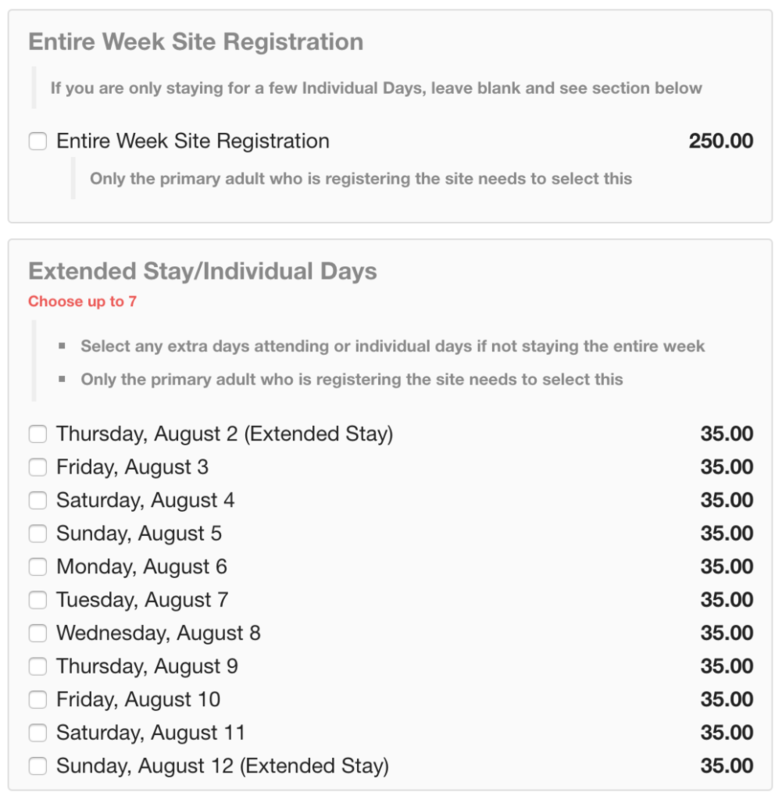 If you are staying the full week of Family Camp, select “Entire Week Site Registration.” If you are only staying for a few days, select the individual days you will be attending instead of “Entire Week Site Registration”. You can also select if you are arriving early or staying late in this section. You will be prompted in Step 5: Forms to enter your site registration details. Again, only one person in your group needs to select the site registration. What are Coffee Cabin/Ice Cream Shack Credits? We are excited to offer credits to our Coffee Cabin and Ice Cream Shack! If you select these at the time of registration, you will be given a card when you check in at Family Camp. This pre-loaded card will be able to be used at both the Coffee Cabin and the Ice Cream shack. These cards can be reloaded throughout the week, however they are non-refundable and can only be used at the current year of Family Camp. 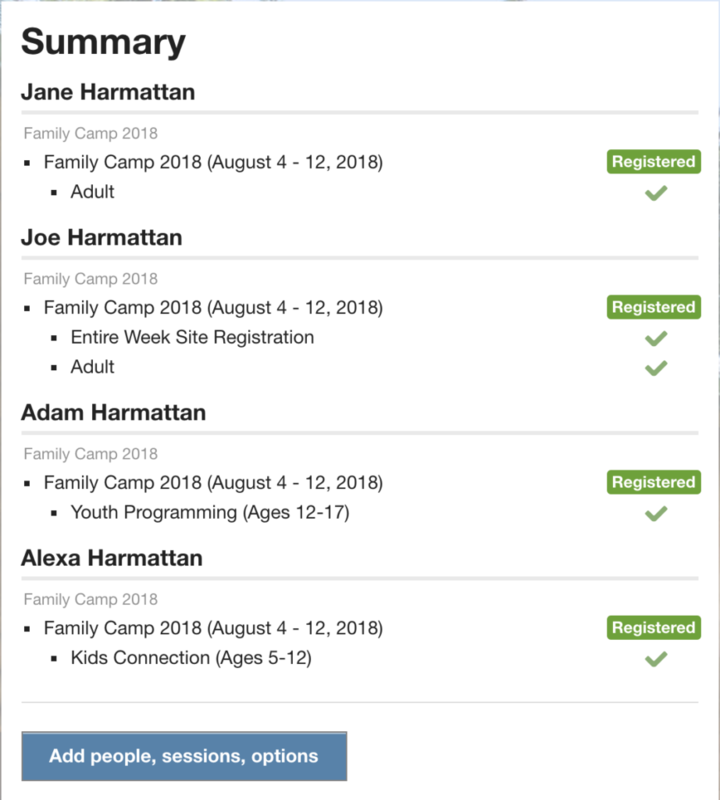 For family camp, you are given the option of paying in full at the time of registration, paying in three monthly installments leading up to Family Camp, or by mailing a cheque to Camp Harmattan. You can return at any point leading up to Family Camp to add people to your registration, purchase additional meal tickets, or purchase Coffee Cabin/Ice Cream Shack Credits. Note: Prices for meal tickets increase after July 15. Log back into your account using the email and password you created at time of registration.